By the early 1990's the wild population of Echo Parakeets (Psittacula eques) had plummeted due to severe deforestation, introduced mammals, and the effects of disease and storms. Progress and outcomes: In 1990 the Durrell Wildlife Conservation Trust (DWCT) invited the World Parrot Trust, along with the Mauritian government and the Mauritius Wildlife Foundation, to support Dr. Carl Jones and his team to save the Echo Parakeet on Mauritius. The team worked to protect and enhance nest sites and boxes, breed birds for release, manage the health of nestlings and encourage the production of more than one clutch per year. Additionally, there has been active management of remaining habitat. WPT made the species a priority and secured signifcant funding over a number of years, as well as providing logistical and other support. Due to the outstanding efforts of several organisatons and dozens of individual contributors, after two decades of intensive management the species has been brought from a low of 12 known individuals to about 700 at present. Where found: Is found on Mauritius, and formerly on Reunion, Mascarene Islands. 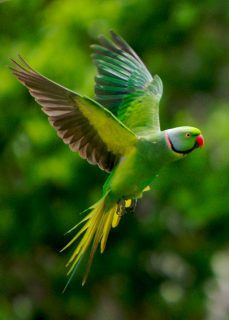 History: The total population of Echo Parakeets (Psittacula eques) has declined because of severe deforestation and degradation of habitat, introduced rats and crab-eating macaques, and the effects of disease and storms. The species exists now only in southwest Mauritius. By the 1970s to the mid-1980s the population of 10 known birds seemed to stop breeding, but then began to improve and by 1993-1994 the population rose to 16-22 birds. By 1997 there were 13 known pairs with a total of 50-60 birds in Black River Gorges National Park in southwest Mauritius (Jones and Swinnerton 1997). Since then, because of intensive management the population has grown steadily, and continued to improve until a drop that occurred in 2004 due to Psittacine Beak and Feather Disease (PBFD). The virus in still present in the population, and 40-50% of fledglings are lost to it and associated infections. By 2010 the population had recovered to over 500, at which point the species was downlisted by IUCN to Endangered from Critically Endangered. Ecology: This species prefers upland forest and lower-level scrub forest, where they rely solely on native plants: buds, young shoots, leaves, flowers, fruits, seeds, twigs, sap and bark. Introduced plants are not taken.